The quilted CD coaster mug rug version 2: the "Lucky 8"! Or... the "Lucky 8" version! In my first go-around at CD upcycling, I made a trio of coaster mug rugs using some scrap fabric, old CDs and fleece that I harvested from an old sweatshirt. 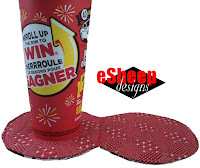 Today, I have a variation on the same theme to share: a double CD coaster/mug rug that's the perfect size for keeping your coffee and cookies off the table. In terms of making it, it really is not much more difficult than making the one with a single CD. Double-ended design is perfect for drink and snack! Its fun shape is reminiscent of an "8" — which is my husband's lucky number. Well, it's also the current decade of my mom's life, which is the more significant fact as this is her Mother's Day present this year. If you want a more detailed explanation, refer to the original tutorial for the single CD coaster. But really, the pictures tell the whole story of how to do this. The first step is to place two CDs side by side and trace around them. Then make several marks 3/4" (2cm) out from the edge of those circles and draw an outer shape as shown. Cut out the resulting pattern template. Use the template to cut two pieces of fabric (I used two different fabrics this time) as well as two pieces of fleece. Then cut four circles of fleece the same size as the CD. Stack the pieces as shown above. Stitch together each set of pieces with a 1/8" (3mm) seam allowance and then quilt them in some fashion. Step 4: Stitch together and then try some free motion quilting! Pin both pieces with right sides together. Mark off two sections that will be kept open at each end in order to slide in the CDs. Make sure that the CDs will fit into those openings before going any further. After pinning, sew the top and bottom seams together with a 1/4" (6mm) seam allowance. Notch the curves around the sewn areas and then turn right side out. Press well after turning. Slide the CDs into the openings at either end and then use clips to continue forming the remainder of the seam. Topstitch around the entire perimeter with as small a seam allowance as you can manage (aim for just under 1/8" or 3mm). Sewing around the curved edges may prove challenging for some, but as with my fab fabric flowers tutorial, there's value in taking on projects like this where you can practice and hone your skills using just scraps of fabric. And as I've said before, sewing is not like laying concrete. If it doesn't turn out well the first time, pick up that seam ripper and try again! Great use for CD's! single or double it is a good way to use those CD's and nits of fabric too!